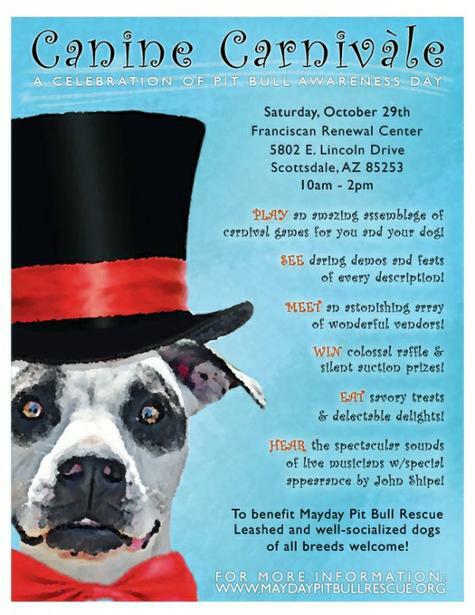 Mark your calendars for Canine Carnivale-A Celebration of Pit Bull Awareness Day!!! Canine Carnivale is a day of games, contests and fun for you and your dog. Food and live music including a special performance by John Shipe of “Pit Bull Blues” fame! All breeds welcome. All dogs must be leashed and well behaved/socialized. Come out and have some fun! For more information, please email info@maydaypitbullrescue.org.